The name is thought to mean “Castle of the Jews”, although some say it is “Break of the Jews” signifying the break in the waters as the Children of Israel crossed the Jordan River and entered the Promised Land. 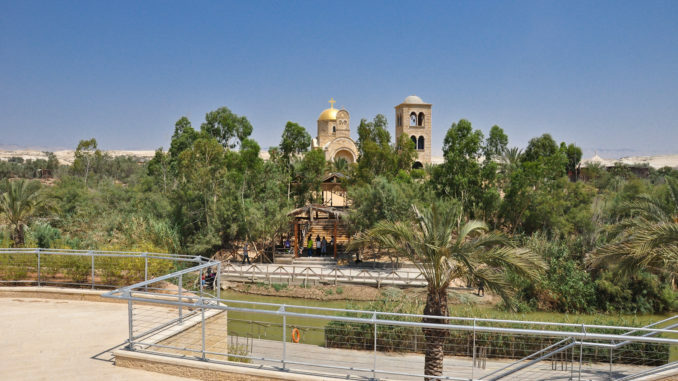 As well as being the traditional site of the historic crossing led by Joshua, it is more famously known among Christians as the site of the baptism of Jesus by John the Baptist. Elijah the prophet is also said to have ascended into Heaven from this area. The site has been drawing pilgrims since the early centuries of Christianity. In fact, on the Israeli side of the Jordan Valley, the area is known as the Land of Monasteries; although an earthquake half a century ago has left most of the stone structures in ruins. During the Six-Day War in 1967, the area was closed to the public and in 1970 landmines were planted by the Israeli army to discourage the frequent terrorist incursions. In the year 2000 there was talk of re-opening the site, but nothing happened for about another decade. Pope John Paul II, however, couldn’t wait and visited Qasr el Yahud in a helicopter and held private worship there. In 2011 the site was renovated and reopened. The Ministry of Tourism, along with other organizations spent over two million dollars in the construction of wooden ramps into the River for access and to avoid erosion. Shade areas were also erected, and restroom, shower and parking facilities were upgraded, including wheelchair access. In the opinion of a regular contributor to Trip Advisor, the area is well maintained and clean, with plenty of space, and the toilets are clean and free. Showers are available for a quick rinse off for those who choose to enter the river. If you don’t like crowds, avoid going there on January 18th; however, if you do like to see a truly moving spectacle, this is the day that thousands of Orthodox Christian pilgrims go to Qasr Al Yahud. Ethiopian monks in traditional dress, accompanied by thousands of pilgrims, all singing, dancing and drumming, go down to the River. The Greek Orthodox Patriarch, accompanied by monks, and a throng of young people playing pipes, beating drums and singing, also descend on the site. It is an extraordinary sight. One may ask, “Why was Jesus baptized if he was without sin?” This is a fair question, one that even John the Baptist asked, and one that adds credence to the idea that the story wasn’t made up. (Why invent something you can’t explain?) The answer to why Jesus was baptized has, in the past, been illustrated with another question, “Why did He ride in a boat if He could walk on water?” Jesus explained to John that He needed to “fulfill all righteousness.” He never asks us to do anything He didn’t do himself. Qasr Al Yahud is within Palestinian Territory, currently under the administration of Israeli authorities; both Israelis and Palestinians freely visit the site. 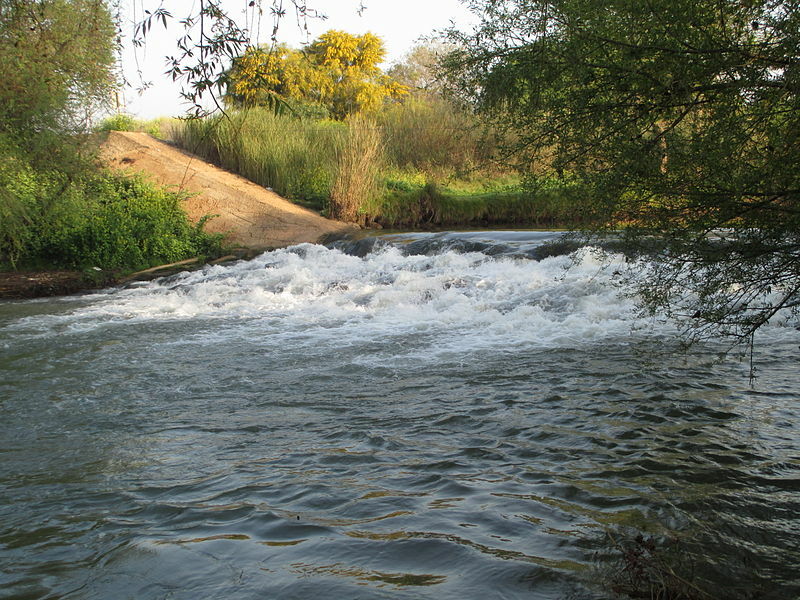 Refurbishment planning has been a collaboration between the Jordanian authorities, the Civil Administration of Judea and Samaria, and the National Parks Authority. Two of the more remarkable features of the area are the cruciform baptismal pool which is refreshed naturally by the flow of the river and the marble steps leading into the water which are mentioned for the first time in writings dating 1400 years ago. Entry to the site is free, including entering the river. If you are considering being baptized at this historical site, stop procrastinating and do it. A baptismal robe is available at the site for 35 New Israeli Shekels, which is about nine dollars US. Hanukkah and Christianity – Hand in Hand?